Connect Quickbooks Online to Salesforce. Fast, Easy & Secure. QB Connect Professional is the fastest and easiest way to sync your QuickBooks Online and Salesforce accounts. Made by Salesforce consultants, our Pro version gives you the most features at the best price. One hour of free support included! QB Connect is the easiest and most cost-effective AppExchange product to integrate your Quickbooks Online account to your Salesforce Professional, Enterprise or Unlimited account. As a consulting company, Cloud Builders tried all the most popular AppExchange products to connect dozens of client’s Salesforce accounts to Quickbooks Online. We built QB Connect because we saw an opportunity for a better product that was easier to use, had a stronger more flexible integration with Quickbooks, and was affordable. QB Connect incorporates our knowledge of Salesforce design, our knowledge of Quickbooks and our knowledge of the limitations of other Quickbooks integration products. QB Connect integrates Quickbooks Online directly with Salesforce. We support Professional, Enterprise and Unlimited Editions. Not sure what version you have? Open Salesforce and hover your mouse over your browser tab at the top of your browser. The version will appear in the help text. Whether your company is new to Salesforce or new to Quickbooks Online, QB Connect enables you to easily sync your historical data. Sync your Salesforce account to your Quickbooks Online customers, or the the other way around. Syncing your historical data is easy with QB Connect and fully documented in our user guide. QB Connect works with Salesforce Classic and the new Lighting Interface. Quickbooks Online allows for up to three custom fields. We support direct integration for all three Quickbooks fields should you create them, and mapping is very easy and fully documented in our configuration guide. QB Connect allows you to integrate invoices directly with the Salesforce Quote or Opportunity standard objects, or our custom Invoice object. Competing products either do not support more than one object or charge more for doing so. Other Quickbooks Online to Salesforce integrations claim to be free or don’t publish their pricing. That’s because they allow for a free download but charge you access to a third party server to connect your two accounts. This not only runs afoul of Salesforce partner terms and conditions, it adds in another layer of exposure to your sensitive financial information. QB Connect is a native Salesforce application (it is code inside your Salesforce organization) that connects directly via api to your Quickbooks online account via an encrypted REST connection. Your data is safe, secure and there are no hidden fees. No Hidden Costs, No Transaction Fees! 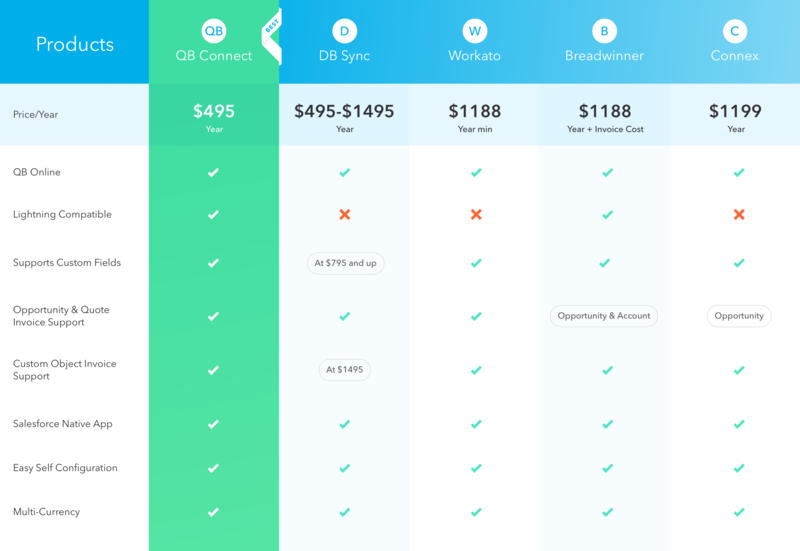 QB Connect charges a straightforward yearly subscription price. Competing products have hidden fees, use external servers and many have transaction costs on top of the yearly subscription expense. Step 1 - Download QB Connect from the AppExchange. Step 2 - Connect to your Quickbooks account. Step 3 - Authorize the connection. It’s that easy! QB Connect Supports Multiple CurrenciesQB Connect supports all the currencies that Quickbooks Online offers. Setting your currency is easy and fully documented in our Integration Guide. QB Connect can easily be configured in three steps. Step 1 - Download QB Connect from the AppExchange. Step 2 - Connect to your Quickbooks account. Step 3 - Authorize the connection. It’s that easy! With each purchase of QB Connect, Cloud Builders offers one hour of support that you can use to assist you in configuration and to answer any questions you may have about integrating Salesforce and Quickbooks online. Our product is both simple to use and easy to configure, but the hour of support is provided as our guarantee of success and something the other products won’t give you, or will charge you for. QB Connect Pro is $495/year with discounts for non-profits. It can be downloaded and installed from our listing on the AppExchange. Why should use QB Connect Pro? Here are a few use cases. Is your business new to both Quickbooks Online and Salesforce? The prospect of setting up two new business software systems can be daunting. QB Connect can help. Not only are we the easiest way for you to connect your two accounts, when you purchase QB Connect it comes with an hour of free consulting. Allow our staff to advise you on best practices and make suggestions on how to configure your accounts so you are positioned for success. Is Quickbooks Online already part of your business? We can help you with that. Once you have your Quickbooks Online account connected to Salesforce, simply use our historical data sync feature to pull all the information from Quickbooks Online into Salesforce. Let us help you make sure your Salesforce Accounts match your Quickbooks Customers and that your products are priced consistently. You can use QB Connect to make sure that the business process you built with Quickbooks Online matches up with how you’re utilizing Salesforce. Whether you want Quickbooks invoices to connect to Salesforce Opportunities, Salesforce Quotes, or our custom Invoice object, we make it easy manage your data. Many of our customers liked being able to generate their invoices in Quickbooks Online rather than Salesforce and QB Connect helps you do that too. No matter where you want to generate your invoices you can quickly and easily generate, then print and mail or email your invoices out to your customers. If you know your way around Salesforce, but you are new to Quickbooks Online, setting up the Quickbooks Online integration is an easy step-by-step process. With the free hour of support we provide, we can answer any Quickbooks Online questions you may have. After setup and connecting your two accounts, you will be able to sync data from Quickbooks Online to Salesforce and send invoices from both and send them directly to your customers. If your business is proficient in both Quickbooks Online and Salesforce, great. You already know your way around both systems so setup of QB Connect will take only a few minutes. Download the app, connect Quickbooks Online and Salesforce and then sync your historical data. You can determine if you want to integrate Quickbooks Online with Opportunities, Quotes or our Invoice object. From there you can generate invoices in Quickbooks Online or in Salesforce and email them directly to your customers. Cloud Builders provides detailed installation and configuration documentation for all of our products and free support with each purchase. You may download the documentation as a pdf from the links at the top and bottom of the page, or view the full documentation on line here. The document will guide you through the process of integrating the Cloud Builders QB Connect application with your Salesforce org. It is broken into three sections: Installation, Configuration and the User Manual. When attempting to install the QB Connect integration App, you might get the error "Missing Organization Feature: Quotes" if the Quotes is not enabled. You will need to have administrative rights to your Salesforce account to make this change. 2. Under App Setup or Build section, Click "Customize"
5. Click the checkbox to "Enable Quotes"
Retrieve the package and install it using the following URL: https://login.salesforce.com/packaging/installPackage.apexp?p0=04t280000007jMk for Production and https://test.salesforce.com/packaging/installPackage.apexp?p0=04t280000007jMk for Sandbox. Enter the username and password for your Quickbooks Account. Authorize the process by clicking Authorize button. This completes the connection between your Quickbooks account and Salesforce. You can now go will be automatically redirected to setup page. How to disassociate your QuickBooks account with the application. This is not part of the installation process, this is for uninstallation only. Go to QB Connect Admin Tab. Click Disconnect QuickBooks button and you will be disconnected and now you can connect to another QB account by following the same QB connect process. QB Connect allows for up to three custom fields created in Quickbooks mapping to Salesforce fields. Once you are connected to QB, you can sync All existing Salesforce Products, Accounts, Invoices, Quotes and Opportunity to Quickbooks or Invoices and Payments data from Quickbooks to Salesforce that is related to Closed Won opportunities. To do this, press the related Start Sync button QB Connect Admin page. It will take few minutes to sync all data. These steps allow you to add Quickbooks data fields to Salesforce page layouts as well as adding custom buttons to sync data. Add Sync to QuickBooksbutton on Account page layout.Add a section on page layout, name it as QB Details.Add QB ID, QB Last Sync Date, QB Error, Email Address fields on QB Details section on Account page layout. Add Sync to QuickBooks, Get All Payments, Get All Invoices buttons on opportunity page layout.Add a section on page layouts, name it as QB Details.Add QB ID, QB Last Sync Date, QB Error, QB Balance, QB Auto Sync, QB Grand Total, QB Total Payment, QB Tax Percent fields on QB Details section on opportunity page layout as shown in below screen.Add Payments, Invoices related list to opportunity page layout. Add Sync to QuickBooksbutton on Quote page layout.Add a section on page layout, name it as QB Details.Add QB ID, QB Last Sync Date, QB Error, QB Estimate Status, Txn Date, QB Tax Percent and other fields on QB Details section on Quote page layout as shown in below screen. Add Sync to QuickBooksbutton on Product page layout.Add a section on page layout, name it as QB Details.Add QB ID, QB Last Sync Date, QB Error fields on QB Details section on product page layout as shown in below screen. If you want to use Tax feature in Quickbooks transactions, you have to login to QuickBooks and click Set Up Sales Tax button in Quickbooks for first time so that Tax feature is enabled, then Tax values will be considered else Tax values will be ignored. With the free version of QB Connect app, you can sync only 20 Invoice/Estimates per month. Paid version of this app has no limits and you can sync any number of records. Automatic Sync – Account can be automatically synced to QB if it has QB ID field value. So Account will never sync to QB when Account is inserted in SF. It will sync only when it is updated and it’s QB Id field is not Null/Blank. This feature is not available in free version of the QB connect app.Manual Sync – Use Sync to Quickbooks button to create/update Customers in QB. This feature is not available in free version of the QB connect app.Individual Account sync feature is available in paid version only. Free version of this app permits syncing accounts associated with invoice/estimate sync only. Automatic Sync – Opportunity will automatically sync to QB if it is Closed Won and Quickbooks Auto Sync(By default True) is True. If you don’t want to Sync an Opportunity which is Closed Won, you can uncheck this field. This feature is not available in free version of the QB connect app.Manual Sync – Use Sync to Quickbooks button to create/update Jobs in QB. This feature is not available in free version of the QB connect app. Individual Opportunity sync feature is available in paid version only. Free version of this app permits syncing Opportunity associated with invoice/estimate sync only. Note : Individual Account sync feature is available in paid version only. Free version of this app permits syncing accounts associated with invoice/estimate sync only. Use this button to fetch all payments made against this opportunity/Job in Quickbooks in salesforce. Use this button to fetch all invoices created/updated against this opportunity/Job in Quickbooks in salesforce. All the available products below opportunity will be added to Invoice when we create Invoice below that Opportunity. Use Copy Address from field to define billing and shipping address for invoice. Automatic Sync –Invoice will automatically sync to QB if it’s Opportunity is Closed Won and Opportunity Quickbooks Auto Sync is True. This feature is not available in free version of the QB connect app. Manual Sync – Use Sync to Quickbooks button to create/update Invoice in QB. Automatic Sync – Products will automatically synced to QB when they are created/updated in Salesforce. This feature is not available in free version of the QB connect app. Manual Sync – Use Sync to Quickbooks button to create/update Items in QB. This feature is not available in free version of the QB connect app. Individual Product sync feature is available in paid version only. Free version of this app permits syncing accounts associated with invoice/estimate sync only. These jobs are responsible for fetching all Payments and Invoices from Quickbooks and update the same in Salesforce. You can select the duration to auto run these schedulers from Quickbooks setup page and then clicking save button to start the schedulers. Theseschedulers are responsible for re-connecting integration process after 150 days of connection without disturbing any sync process. How can we help you? Send us a message with as much information about your project as possible. You can use the contact form or call/email us directly.